Sound engineer, composer and Oxford researcher Duncan Williams will present "Commercial Recording and Contemporary Composition," a free lecture, at 2 p.m. Friday, Sept. 28, in the Music Recital Hall in the Wright Music Building on the SFA campus. NACOGDOCHES, TEXAS - An analysis of popular recording techniques will be presented at 2 p.m. Friday, Sept. 28, in the Music Recital Hall in the Wright Music Building on the Stephen F. Austin State University campus as a joint presentation of the SFA College of Fine Arts and School of Music. "Commercial Recording and Contemporary Composition" features Duncan Williams, a psychoacoustician, sound engineer and composer from the University of Oxford. Williams will present "a range of contemporary experimental pieces from leading composers in the electroacoustic domain," according to Kevin Kelleher, coordinator of the sound recording technology program at SFA. Williams will demonstrate various techniques, such as spatialisation and timbral manipulation by signal processing, and will provide a look "under the bonnet" of the pieces, giving the audience an opportunity to critically engage and debate the composition, Kelleher said. The title for the free lecture, which is part of the 2012-2013 Cole Performing Arts Series, was selected because it encapsulates an online course Williams and Kelleher created for SFA's SRT program - MUT 360 Commercial Recording and Contemporary Composition - which is offered during the spring semester. In addition to the SRT students who will benefit from the lecture, music composition students will also learn from Williams' presentation, Kelleher said. "Students majoring in composition will find a view of contemporary composition relevant to their interests," Kelleher said. "Anyone with an interest in music, technology and the recording process will greatly benefit from this lecture because of Williams' musical background and international perspective." In 2011, Williams was the recipient of the University of Oxford's Humanities Division Teaching Award for supporting innovation in teaching, allowing him to devise a new course in experimental composition using Max/MSP for postgraduate composition students. 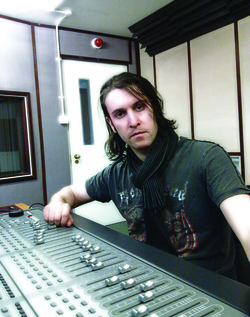 His research interests are in classical recording, perceptual evaluation of microphone techniques and experimental and electronic composition. He's had a number of commercial compositions published with EMI Production Music, De Wolfe and West One and a back catalogue with Warner-Chappel. The Wright Music Building is located at 2210 Alumni Drive.